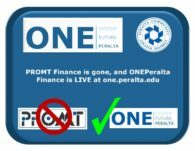 As a valued vendor to Peralta Community College District (Berkeley City College, College of Alameda, Laney College, Merritt College, District Administrative Center), we want to let you know about some anticipated changes to our Procurement processes as part of our upgrade to our payment system that will be effective starting in late May 2018. These changes will impact how you submit Purchase Orders and invoices, and will help us promptly process your payments. Please note that NO Peralta orders may be placed without a signed Purchase Order from the Peralta Purchasing Department. Benefits for vendors will include standardized communications, consistent invoices, and faster payments. Please look for future email communications that will provide more details about these changes. We appreciate your patience and support as we make these improvements. If you have any questions, please contact vendors@peralta.edu or 510-466-7225.